(September 2010)  The high-energy hijinks of the popular comedy troupe The Second City Touring Company will launch the Hanover College Community Arts Series 2010-11 season. The Second City will join Hesperus Early Music Ensemble, legendary folk artist John McCutcheon and a contemporary Christian music festival in the series 58th season. for exhibiting all types of artwork. The Second City will kick off the series Friday, Sept. 17, with Fair & Unbalanced, an unbridled look at present-day America. The performance will begin at 7:30 p.m. in Parker Auditorium. The Second City has performed around the world at theatres, colleges and universities and festivals for 50 years. The comedy troupe has become an international phenomenon by making its mark in live theatre, motion pictures and television. Their alumni list includes such stars as Stephen Colbert, Tina Fey, Steve Carell, Mike Myers, Julia Louis-Dreyfus, Ryan Stiles, John Belushi, Dan Ackroyd, Bill Murray, John Candy and Chris Farley. The Hesperus Early Music Ensemble will be featured in concert Thursday, Oct. 28, at 7:30 p.m. in Fitzgibbon Recital Hall, Lynn Center for Fine Arts. Started in the late 1970s, the ensemble performs early European music, American folk and a blend of genres. Hesperus has produced 14 albums and its music was featured in the 1999 film, Sleepy Hollow. The group was the resident ensemble at the National Museum of American History from 1989-1996. Singer, songwriter, folklorist and producer John McCutcheon will perform at 7:30 p.m. Thursday, Feb. 10, in Parker Auditorium. McCutcheon has toured the globe and released 31 albums since the early 1970s. He also has produced more than 25 albums and earned six Grammy nominations. A master of a dozen traditional instruments, McCutcheon is widely-lauded for his work on the hammered dulcimer. The Hesperus Early Music Ensemble and John McCutcheon also will perform concerts for area school children. Each will perform at 10 a.m. the same day as their scheduled evening concert. Hanover will cap the 2010-11 series with The Revolution Experience: A Festival of Christian Music. Six contemporary Christian music acts are slated to perform during the event, which will run from 2-10 p.m. Saturday, May 21, at L.S. Ayres Field. Season subscriptions are available for the Community Arts Series until Sept. 17 at considerable savings over the cost of single-session tickets. Patrons can subscribe to the entire four-event series, plus all season subscribers also receive a complimentary season pass to the Hanover College Theatres four main-stage productions ($48 value). n Information about the series, season subscriptions and individual performance tickets are available by calling the Hanover box office (812) 866-7110 or online at: www.Hanover.edu/arts. The Hanover College Theatres 65th season in Parker Auditorium will feature four mainstage productions during the 2010-11 academic year. The theatre season will begin with the comedy-drama Anatomy of Gray. Performances will run Friday-Sunday, Oct. 8-10, which is also the Colleges Homecoming weekend. Written by Jim Leonard Jr., Anatomy of Gray blends humor, folklore and myth in a story about a mysterious doctor who rides a tornado to an isolated Indiana town in the 1800s. Leonard, a 1978 Hanover graduate, is currently a Los Angeles-based writer for the stage and screen. Between War and Peace is a comic fable of the seductress, Politica, who is married to War, but flirts with her clandestine lover, Peace. Baggage watches a traveler in an airport lounge struggle with the baggage of his past. The poignant comedy, A Tree on the Border, is receiving its premier U.S. production at Hanover. The work tells the story of a remote village, its people and a way of life who are cut in half by a newly-imposed international boundary. The seasons final mainstage production will be William Shakespeares Two Gentlemen of Verona, Friday-Sunday, March 18-20. The play, directed by associate professor Jim Stark, will be part of the Colleges traditional biannual Shakespeare Festival. One of Shakespeares first plays, this romantic comedy follows the trail of two friends on their path to the women they truly love. All performances will begin nightly at 7:30 p.m. General admission tickets cost $12 for adults, $10 for seniors (65 and over) and $5 for young people, high school and under. Admission is free to season subscribers to the college Community Arts Series. Information and tickets are available by calling the Hanover box office at (812) 866-7110 or online at www.Hanover.edu/ARTS. Tickets will also be available at the door before each performance. Hanover Colleges Greiner Art Gallery has announced its exhibition schedule for 2010. All exhibitions and events are free to the public. 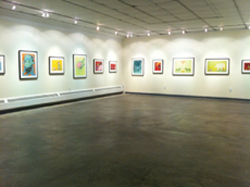 The gallery is located in the front lobby of the Center for Fine Arts building on the Hanover College campus.  Sept. 6 - Oct. 1: (Un)Conscious Reasoning by Mark Hosford, Associate Professor, Vanderbilt University. Closing reception and gallery talk is 5-7 p.m. Friday, Oct. 1.  Oct. 8-29: Interface, curated by Mike Deetsch 1998. After completing a masters degree from Pratt, Deetsch was a senior museum educator at Brooklyn Museum and has since moved back to Kentucky, where he has been successful in bringing art and programming to both Lexington and Frankfort. For his exhibition, he has selected artworks by Kristina Arnold and Bobby Campbell.  Nov. 9 - Dec. 7: In the Shadow of Cortes: From Veracruz to Mexico. Through the generous support of Lilly Endowment, this exhibit features the work of two Indiana Universwity professors: historian Kathleen Ann Myers and photojournalist Steve Raymer.  January: A group exhibition featuring artwork by the faculty of the Georgetown College Art Department: Daniel Graham, Boris Zakic Darrell Kincer.  February: Senior Art History Major Co-Curatorial Exhibition. Selected, researched and installed by the senior art history majors, this exhibition features artworks from the Hanover College private art collection.  March: Senior Studio Art Major Independent Study Thesis Exhibitions. These exhibitions feature artwork and installations developed, designed and created by senior art majors.  May 6-26: Regional High School Juried Exhibition.  For information on these exhibitions, call (812) 866-7110 or visit: www.hanover.edu/arts.